+ 1/2 tsp. dry citric acid (aka “Sour Salt”) or the juice of one or two large juicy Lime(s). Combine all ingredients, except the meat, in a glass or ceramic mixing bowl and stir with a wooden spoon until the sugar and salt are dissolved completely. Place sliced meat in glass or ceramic dish or bowl and cover with marinade. Turn meat well to insure that all meat is covered with marinade. Pour the remaining Coke™ slowly over ice and drink in large gulps ending each one with a loud “Aaaahhh!” Calmly ignore the angry glares of any and all bystanders. Pack tightly and place a layer of plastic wrap directly on surface of meat to reduce exposure to air. Place another layer of plastic wrap over the rim of the bowl or dish and refrigerate for 12 to 18 hours. Marinating in one or two Ziplock freezer bags work just as well for this. Squeeze as much of the air out of the Ziplock bag as possible. Simply massage Ziplock bag once in a while and turn over to make sure that the marinade is getting between all the slices. After the meat has marinated, place in single layer in the dehydrator making sure that no pieces are folded, twisted or touching. 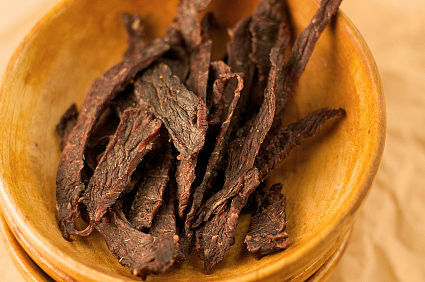 Sprinkle a little fresh cracked pepper or brush some Sriracha sauce directly on some of the meat for a spicier jerky experience! 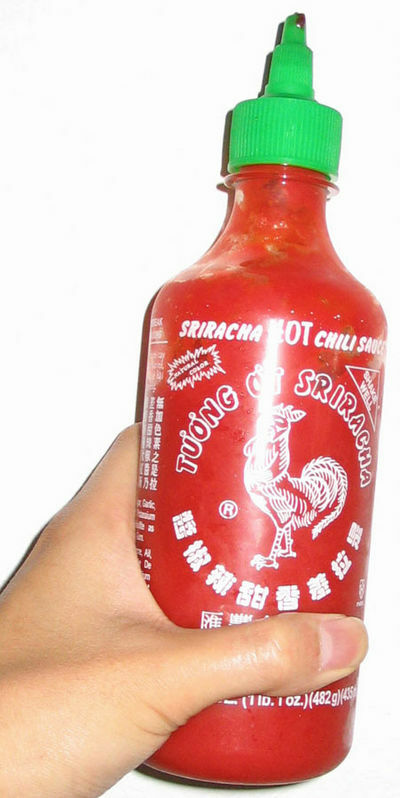 A bottle of the Huy Fong brand “Sriracha” hot sauce. Optionally, if you have a big enough smoker, place the dehydrator trays in a heavy hickory or apple smoke for about an hour, then place trays in your dehydrator. Dry until the meat cracks slightly when bent, but not so dry that it snaps! Remove the thinner slices as they dry and hide them from the kids. This is really the trickiest part. 2 comment(s) on this page. Add your own comment below. Just a note about my recommendation of placing the dehydrator trays in the smoker. 1. Make sure the smoker is not too hot. 160°F Max. or the trays may soften, distort or sag. 2. The dehydrator trays will permanently discolor in the smoke. Mine are all a nice tan color. Jerri Self needed a recipe to use up some leftover turkey meat, so here is a very rich pasta meal that will make you forget you are eating leftovers, I promise. Another tasty “Aldi-licious” bargain meal. Moist and flavorful turkey burgers with a Kansas City BBQ twist.